This week, the Future of Privacy Forum (FPF) released a new white paper entitled, “A Practical Privacy Paradigm for Wearables,” which I believe can help us find policy consensus regarding the privacy and security concerns associated with the Internet of Things (IoT) and wearable technologies. I’ve been monitoring IoT policy developments closely and I recently published a big working paper (“The Internet of Things and Wearable Technology: Addressing Privacy and Security Concerns without Derailing Innovation”) that will appear shortly in the Richmond Journal of Law & Technology. I have also penned several other essays on IoT issues. So, I will be relating the FPF report to some of my own work. Unfortunately, the reality that automated vehicles will eventually kill people has morphed into the illusion that a paramount challenge for or to these vehicles is deciding who precisely to kill in any given crash. This was probably not the intent of the thoughtful proponents of this thought experiment, but it seems to be the result. Late last year, I was asked the “who to kill” question more than any other — by journalists, regulators, and academics. An influential working group to which I belong even (briefly) identified the trolley problem as one of the most significant barriers to fully automated motor vehicles. Although dilemma situations are relevant to the field, they have been overhyped in comparison to other issues implicated by vehicle automation. The fundamental ethical question, in my opinion, is this: In the United States alone, tens of thousands of people die in motor vehicle crashes every year, and many more are injured. Automated vehicles have great potential to one day reduce this toll, but the path to this point will involve mistakes and crashes and fatalities. Given this stark choice, what is the proper balance between caution and urgency in bringing these systems to the market? How safe is safe enough? I’ve spent much of the past year studying the potential public policy ramifications associated with the rise of the Internet of Things (IoT). As I was preparing some notes for my Jan. 6th panel discussing on “Privacy and the IoT: Navigating Policy Issues” at this year’s 2015 CES show, I went back and collected all my writing on IoT issues so that I would have everything in one place. Thus, down below I have listed most of what I’ve done over the past year or so. Most of this writing is focused on the privacy and security implications of the Internet of Things, and wearable technologies in particular. I plan to stay on top of these issues in 2015 and beyond because, as I noted when I spoke on a previous CES panel on these issues, the Internet of Things finds itself at the center of what we might think of a perfect storm of public policy concerns: Privacy, safety, security, intellectual property, economic / labor disruptions, automation concerns, wireless spectrum issues, technical standards, and more. When a new technology raises one or two of these policy concerns, innovators in those sectors can expect some interest and inquiries from lawmakers or regulators. But when a new technology potentially touches all of these issues, then it means innovators in that space can expect an avalanche of attention and a potential world of regulatory trouble. Moreover, it sets the stage for a grand “clash of visions” about the future of IoT technologies that will continue to intensify in coming months and years. What sort of public policy vision should govern the Internet of Things? I’ve spent a lot of time thinking about that question in essays here over the past year, as well as in a new white paper (“The Internet of Things and Wearable Technology: Addressing Privacy and Security Concerns without Derailing Innovation”) that will be published in the Richmond Journal of Law & Technology early next year. But I recently heard three policymakers articulate their recommended vision for the Internet of Things (IoT) and I found their approach so inspiring that I wanted to discuss it here in the hopes that it will become the foundation for future policy in this arena. Last Thursday, it was my pleasure to attend a Center for Data Innovation (CDI) event on “How Can Policymakers Help Build the Internet of Things?” As the title implied, the goal of the event was to discuss how to achieve the vision of a more fully-connected world and, more specifically, how public policymakers can help facilitate that objective. It was a terrific event with many excellent panel discussions and keynote addresses. 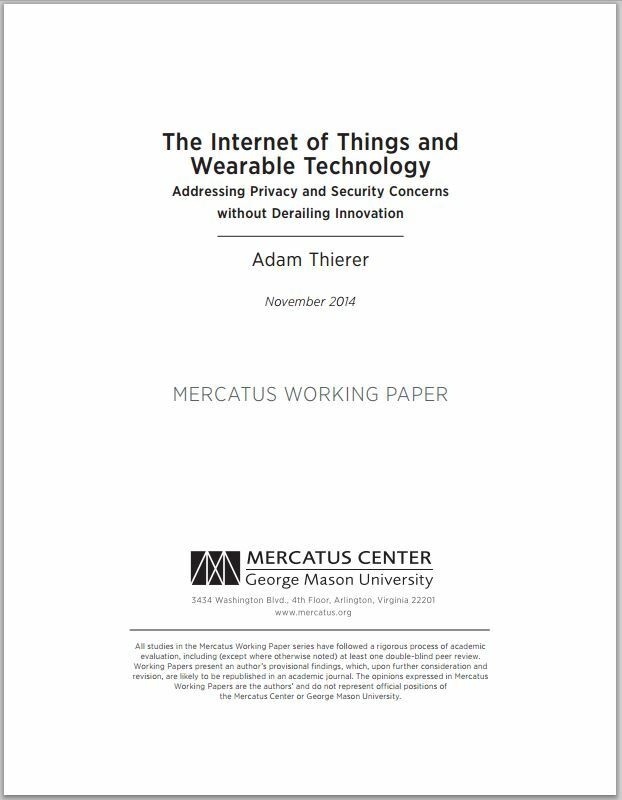 The Mercatus Center at George Mason University has just released my latest working paper, “The Internet of Things and Wearable Technology: Addressing Privacy and Security Concerns without Derailing Innovation.” The “Internet of Things” (IoT) generally refers to “smart” devices that are connected to both the Internet and other devices. Wearable technologies are IoT devices that are worn somewhere on the body and which gather data about us for various purposes. These technologies promise to usher in the next wave of Internet-enabled services and data-driven innovation. Basically, the Internet will be “baked in” to almost everything that consumers own and come into contact with. Some critics are worried about the privacy and security implications of the Internet of Things and wearable technology, however, and are proposing regulation to address these concerns. In my new 93-page article, I explain why preemptive, top-down regulation would derail the many life-enriching innovations that could come from these new IoT technologies. Building on a recent book of mine, I argue that “permissionless innovation,” which allows new technology to flourish and develop in a relatively unabated fashion, is the superior approach to the Internet of Things. I’m pleased to announce that the Mercatus Center at George Mason University has just released my latest working paper, “Removing Roadblocks to Intelligent Vehicles and Driverless Cars.” This paper, which was co-authored with Ryan Hagemann, has been accepted for publication in a forthcoming edition of the Wake Forest Journal of Law & Policy. In the paper, Hagemann and I explore the growing market for both “connected car” technologies as well as autonomous (or “driverless”) vehicle technology. 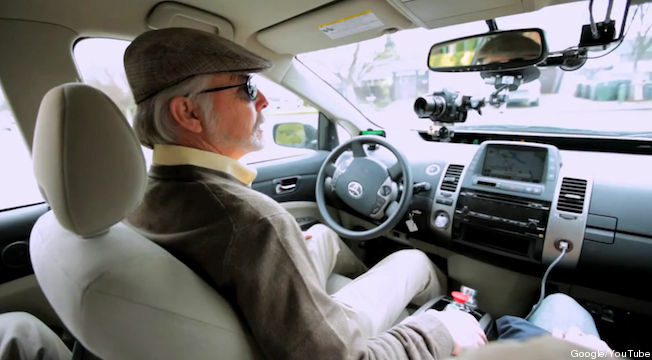 We argue that intelligent-vehicle technology will produce significant benefits. Most notably, these technologies could save many lives. In 2012, 33,561 people were killed and 2,362,000 injured in traffic crashes, largely as a result of human error. Reducing the number of accidents by allowing intelligent vehicle technology to flourish would constitute a major public policy success. As Philip E. Ross noted recently at IEEE Spectrum, thanks to these technologies, “eventually it will be positively hard to use a car to hurt yourself or others.” The sooner that day arrives, the better. These technologies could also have positive environmental impacts in the form of improved fuel economy, reduced traffic congestion, and reduced parking needs. They might also open up new mobility options for those who are unable to drive, for whatever reason. Any way you cut it, these are exciting technologies that promise to substantially improve human welfare. On Thursday, it was my great pleasure to present a draft of my forthcoming paper, “The Internet of Things & Wearable Technology: Addressing Privacy & Security Concerns without Derailing Innovation,” at a conference that took place at the Federal Communications Commission on “Regulating the Evolving Broadband Ecosystem.” The 3-day event was co-sponsored by the American Enterprise Institute and the University of Nebraska College of Law. In the meantime, however, I thought I would post the 46 slides I presented at the conference, which offer an overview of the nature of the Internet of Things and wearable technology, the potential economic opportunities that exist in this space, and the various privacy and security challenges that could hold this technological revolution back. I also outlined some constructive solutions to those concerns. I plan to be very active on these issues in coming months. When Google announced it was acquiring digital thermostat company Nest yesterday, it set off another round of privacy and security-related technopanic talk on Twitter and elsewhere. Fear and loathing seemed to be the order of the day. It seems that each new product launch or business announcement in the “Internet of Things” space is destined to set off another round of Chicken Little hand-wringing. We are typically told that the digital sky will soon fall on our collective heads unless we act preemptively to somehow head-off some sort of pending privacy or security apocalypse. Meanwhile, however, a whole heck of lot of people are demanding more and more of these technologies, and American entrepreneurs are already engaged in heated competition with European and Asian rivals to be at the forefront of the next round Internet innovation to satisfy those consumer demands. So, how is this going to play out? This gets to what becoming the defining policy issue of our time, not just for the Internet but for technology policy more generally: To what extent should the creators of new technologies seek the blessing of public officials before they develop and deploy their innovations? We can think of this as “the permission question” and it is creating a massive rift between those who desire more preemptive, precautionary safeguards for a variety of reasons (safety, security, privacy, copyright, etc.) and those of us who continue to believe that permissionless innovation should be the guiding ethos of our age. The chasm between these two worldviews is only going to deepen in coming years as the pace of innovation around new technologies (the Internet of Things, wearable tech, driverless cars, 3D printing, commercial drones, etc) continues to accelerate. CES 2014 Report: The Internet of Things Arrives, but Will Washington Welcome It? With each booth I pass and presentation I listen to at the 2014 International Consumer Electronics Show (CES), it becomes increasingly evident that the “Internet of Things” era has arrived. In just a few short years, the Internet of Things (IoT) has gone from industry buzzword to marketplace reality. Countless new IoT devices are on display throughout the halls of the Las Vegas Convention Center this week, including various wearable technologies, smart appliances, remote monitoring services, autonomous vehicles, and much more. This isn’t vaporware; these are devices or services that are already on the market or will launch shortly. Some will fail, of course, just as many other earlier technologies on display at past CES shows didn’t pan out. But many of these IoT technologies will succeed, driven by growing consumer demand for highly personalized, ubiquitous, and instantaneous services. But will policymakers let the Internet of Things revolution continue or will they stop it dead in its tracks? Interestingly, not too many people out here in Vegas at the CES seem all that worried about the latter outcome. Indeed, what I find most striking about the conversation out here at CES this week versus the one about IoT that has been taking place in Washington over the past year is that there is a large and growing disconnect between consumers and policymakers about what the Internet of Things means for the future. When every device has a sensor, a chip, and some sort of networking capability, amazing opportunities become available to consumers. And that’s what has them so excited and ready to embrace these new technologies. But those same capabilities are exactly what raise the blood pressure of many policymakers and policy activists who fear the safety, security, or privacy-related problems that might creep up in a world filled with such technologies.